Beneath the gaze of the gods, the mighty armies of Greece and Troy met in fierce and glorious combat, scrupulously following the text set forth in Homer’s timeless narrative, but that was before twenty-first century scholar Thomas Hockenberry stirred the bloody brew, causing an enraged Achilles to join forces with his archenemy Hector and turn his murderous wrath on Zeus and the entire pantheon of divine manipulators; before the swift and terrible mechanical creatures that catered for centuries to the pitiful idle remnants of Earth’s human race began massing in the millions, to exterminate rather than serve. What could I say – the second part of Ilium pushed all my buttons. The right buttons. I didn’t believe it could be as good as the first part but it almost was. Almost. Imagine Homer’s Iliad plus Greek myths coming to life. Imagine two sentient machines saving themselves and entire humankind. Imagine monsters from Shakespeare’s Tempest degenerating into something truly hideous but mesmerizing at the same time. Imagine an American professor of classic literature going to bed with Helen of Troy. Imagine the epic aristeia (a duel) between Achilles and Zeus himself. Nothing was able to spoil that book for me – not even the fact that several characters were killed/murdered and then, almost miraculously, reincarnated/revived/resurrected. If you are a nanotechnological construct EVERYTHING can happen, right? Setebos, one of the main baddies, just disappeared – so what? The vision created by Simmons still remained pretty much awesome. There was a wiff of islamophobia; I skimmed that and rushed on. Greek gods were waiting for me and they were in the middle of an epic battle for supremacy, how could I miss that? Of course there were story arcs which I liked better and those which were good but a bit superfluous. I still loved following two mechanical friends, Mahnmut and Orphu, around but I admit I could do without Harman, Ada, and their ordeal. Still the fact that Daemon had to deal with offspring of Setebos was one big highlight. Overall I was pretty awed by the author’s ability to combine the technical side of his futuristic world build with philosophy and very humanistic references to such classics as Proust, Blake, Shakespeare even the Bible. That’s, in my very humble opinion, sci-fi literature at its best. Go read this series at once – all of it. That’s an order. 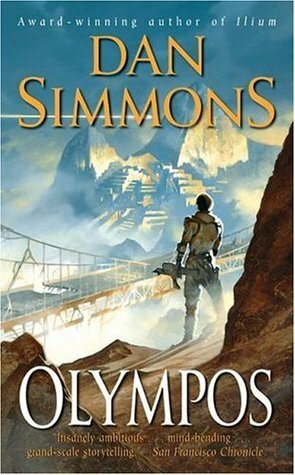 Resistance is futile ;p.
This entry was posted in alternate history, book review, dystopia, one brilliant book, paranormal, psychological, rating, sci-fi and tagged dan simmons, intelligent sci-fi, must-read, olympos, one brilliant book, series alert, that's how it should be done. Bookmark the permalink. Mhmmm interesting premise. Thanks for sharing!